The Angel, by Kevin Storch, October 1998. In the mid '90s many large trees in the Avenues Conservation Area in Hull, East Yorkshire, were being cut down to reduce subsidence. The residents regretted the loss of the trees, and in 1998 artist Kevin Storch agreed to sculpt a trunk if it could be left in place. 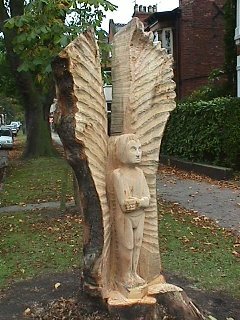 This became the Angel, in Marlborough Avenue. Other artists joined the project, and now there are twelve tree sculptures. The latest is: St Cuthbert in Marlborough Avenue. 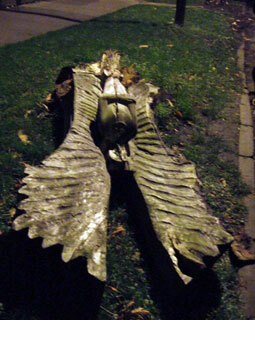 Eight years later, some time between 6pm and 9pm on 30 November 2006, the Angel fell. Its face vandalised long before, body rotting, feet gone, its wings remain sturdy, though riddled with woodworm.